Aggie Whyte was born in Ballinakill, Co Galway. Her first teacher was undoubtedly her father, Tommy Whyte, a well-known musician and a founder member of the Ballinakill Céilí Band. Ballinakill is located in an area steeped in traditional music and at that time every house boasted a fiddle or a flute in the chimney corner. 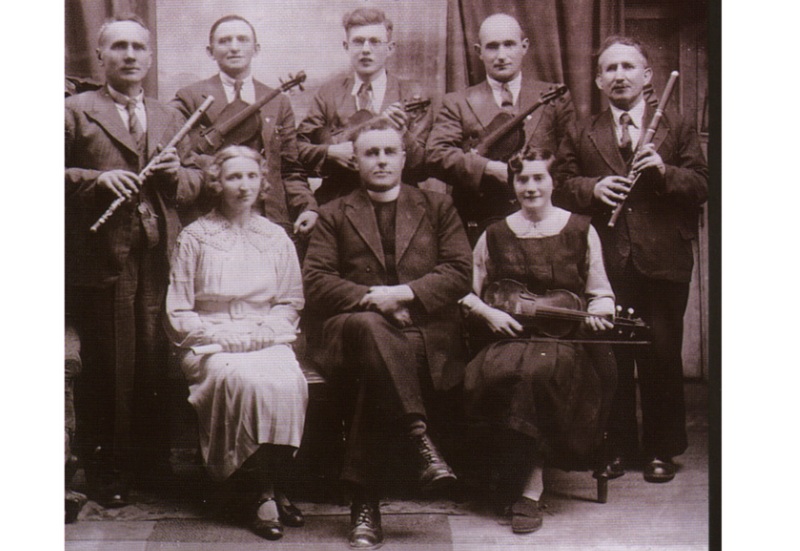 The Original Ballinakill Céilí Band 1929 l to r: Stephen Moloney, Tommy Whyte, Anna Rafferty, Gerry Moloney, Tommy Whelan. Photo courtesy Martin Fahy. Aggie attended Ballinakill National School where she was one of the first pupils of a rare and dedicated teacher of traditional music, Jack Mulkere. 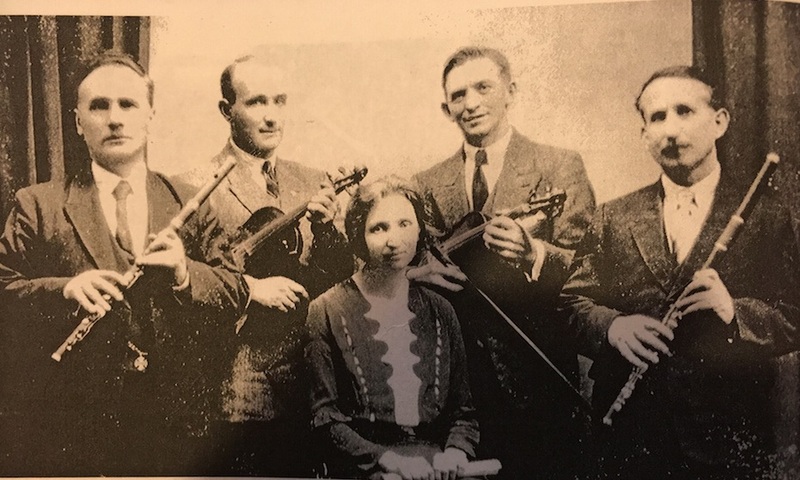 From an early age Aggie showed promise of becoming a brilliant fiddler and, as she progressed, she was in great demand for concerts and Feiseanna in the locality. Her own home in Ballinakill was at that time the mecca for musicians from far and near. Her many early successes included trophies won at Feiseanna at Creggs, Roscommon, Ardrahan, Gort and Ballinakill itself. All along the way, she was encouraged by her local patriot priest Fr Tom Larkin, himself a great fiddler, and one of the founder members of the Ballinakill Céilí Band. Names renowned for music in the area included: The Moloneys; The Brodericks; The Raffertys; The Whelans; The Mullins; The Larkins; The Murrays and countless others as well as The Whytes. Indeed some member in every Ballinakill family, from the Ben Hill to Keane’s Pound and down to the hills of Clare, played music. In 1938 Aggie travelled to England with the Ballinakill Céilí Band. During the trip they made several recordings at His Master’s Voice studios. Aggie was by this time a regular member of the band and they travelled extensively. One of their engagements was playing at the 21st birthday party of Lord Killanin, past President of the Olympic Council. Ballinakill Céilí Band: Standing l to r: Stephen Moloney, Gerry Moloney, Kevin Moloney, Tommy Whyte, Tommy Whelan. Seated l to r: Anna Rafferty, Fr Tom Larkin, Aggie Whyte. Photo courtesy Yvonne Fahy. Following her success in Newcomers’ Hour and her participation in many radio programmes in Ireland, England and Scotland, Aggie had become a household name. During post-war years, she featured in reciprocal folk music programmes between Irish, Dutch and Italian radio stations. Aggie paid many visits to Dublin and the ‘Calling House’ was of course The Pipers Club. Here she partnered the Rowsomes, Seerys, Brogans, Kellys, Gormans, Recks and Mulligans. Aggie was by then a brilliant fiddler winning the All-Ireland Senior Fiddle competition in Cavan in 1954 and the Oireachtas Gold Medal in 1958. In 1978 Aggie was invited to UCC to participate in a seminar of fiddling styles. She represented the Galway style of fiddle playing and recordings of her music are lodged in the University Library in UCC. 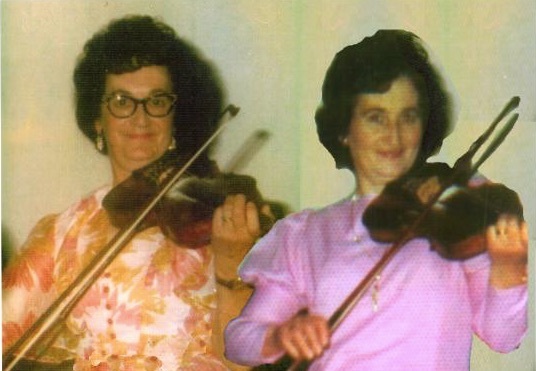 Aggie’s sister Bridie Fahy was also an accomplished fiddler and the recording made by both sisters of ‘The Bird in the Tree’ was archived by the Folklore Commission and adjudged by Seamus Ennis as being the most perfect fiddle duet ever recorded. With the founding of Comhaltas Ceoltoirí Éireann, traditional music got a new lease of life and Aggie and her husband Seamus Ó Riain set up many branches in Co Galway. Their dedication to Comhaltas remained staunch throughout their lives. This great musical tradition has been passed down to the next generation of Ryans and Fahys. Aggie’s twin daughters, Kathleen and Maureen, inherited this wonderful tradition and both are accomplished singers. Aggie’s nieces and nephews – the Fahy’s of Ballinakill – have gained wide acclaim for their brilliant musical talent and Máirín plays with pride Aggie’s own favourite fiddle reputed to be 300 years old. Nature hushed on 16th August 1979 when Aggie Whyte Ryan said her final goodbye to Ballinakill and the country she loved so well. Within hours, news of her death had travelled throughout the length and breadth of Ireland. 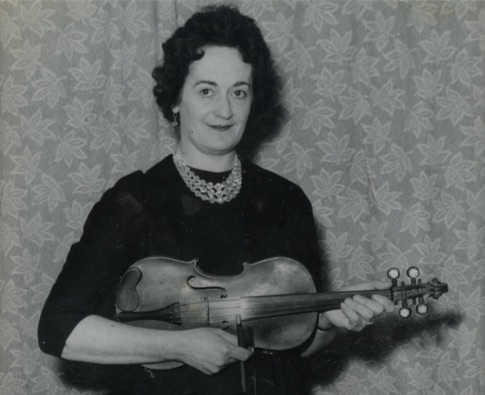 The lady described by Seamus Ennis as ‘Queen of Fiddlers’ had gone to her final reward. This wonderful musician who had so often recorded for His Master’s Voice now responded to her heavenly master’s call and the appointment that she had to fill at the Seisiun in Birr was kept in Heaven. The darting lúidín and nimble fingers and sweeping bowhand were now at rest. The above piece has been adapted from the tribute to Aggie Whyte Ryan, written by Martin Fahy following Aggie’s untimely death in 1979. The full tribute was published in the book ‘Ballinakill Derrybrien – Lore and Legend’ edited by Martin Fahy, Ballinakill. Very interesting story of a talented fiddler, it is wonderful that her niece still uses the instrument.